The apartment was beautiful. It was in the heart of the historic central district. The location was great. The room is very nice decorated, very modern and sophisticate. Great location. Like a private villa in the middle of town. It was absolutely beautiful. Location was perfect. Great position for visiting attractions, shops, restaurants . Lovely Character, room warm despite being freezing outside, nice coffee/tea facilities, great bed. We loved the location, the quality of the apartment, the decor and amenities. Medieval property sympathetically modernised to a very high standard. Location was 20 metres from the centre of town. Excellent communications with friendly hosts. The location of this fabulous apartment was ideal for those wanting to stroll to your destination for eating, drinking, shopping etc. The car was not needed as all to get around Colmar and although the accommodation was in the very centre of Colmar, being tucked away behind huge wooden gates kept it a secret and away from all the noise. Apartment was everything and more than expected. The most perfect place to kick off your shoes after strolling round the gorgeous streets of Colmar and relax. Special location right middle of Colmar, but in the same time quiet. Good quality furniture, comfortable bed and a great design. Very interesting room, pretty small but efficient furnished and nice idea with the shower and jacuzzi behind the bed. Lock in a great price for Le 1615 - Luxe et Spa – rated 8.9 by recent guests! 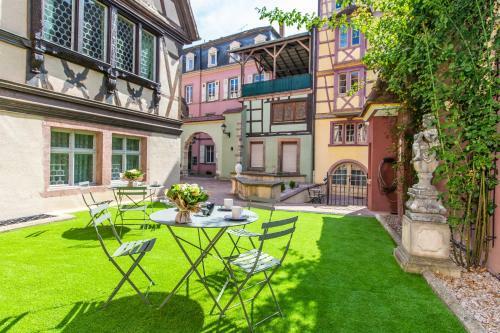 One of our top picks in Colmar.Featuring free WiFi throughout the property, Le 1615 - Luxe et Spa offers accommodations in Colmar, a few steps from Saint-Martin Collegiate Church. The rooms include a flat-screen TV. Certain rooms have a seating area for your convenience. You will find a coffee machine in the room. Rooms include a private bathroom equipped with a spa bath. Extras include free toiletries and a hairdryer. House of the Heads is 1,000 feet from Le 1615, while Colmar Expo is 1.7 mi away. The nearest airport is Basel Airport, 34 mi from Le 1615. 뀐 Located in the real heart of Colmar, this property has an excellent location score of 9.7! 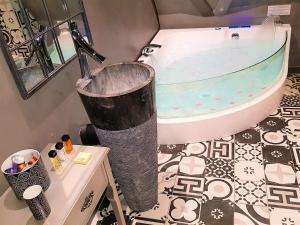 When would you like to stay at Le 1615 - Luxe et Spa? This apartment features a sofa, toaster and spa bath. This suite features a electric kettle, cable TV and spa bath. The four-star accomodation "The 1615", is a magic place steeped in history. This house was built in 1615 and is one of the oldest house of Colmar. It has been classified as "Historic Monument" and was renovated in the purest Alsatian tradition. "The 1615" is nested in an unsuspected inner courtyard, shielded from the agitations of the visitors of the city. It was highlighted with high-quality materials to welcome privileged visitors. After a professional career of 16 years as a business manager, I am now very happy creating unforgettable stays for visitors in our amazing region. In fact, I pay a lot of attention to the aesthetics of my apartments, helping travellers to enjoy their stay in Alsace. "The 1615" is located "in the heart of the heart" of the historic center, while benefiting from the peace of an inner courtyard. From the accommodation, the visitors can benefit on foot of all animations and cultural visits of the city. House Rules Le 1615 - Luxe et Spa takes special requests – add in the next step! Le 1615 - Luxe et Spa accepts these cards and reserves the right to temporarily hold an amount prior to arrival. Please note that check-in after 20:00 is done using a key box and that telephone assistance is provided for that kind of late check-in. Check-in is not possible after 23:00. Very difficult to find, no signage what so ever, parking really difficult and expensive . Although the location is quiet if you are in the downstairs apartment, you can hear every foot step, conversation and TV noise of the guests above - some sort of sound proofing needed although appreciate this may be difficult in such an old building. Parking was a bit of a problem. The booking information states that the apartment is non-smoking, however the sister apartment below (owned by same company) had a smoker and our apartment smelled very strongly of cigarette smoke. Disappointing for non-smokers. The facilities could be more convenient. The location is very nice! Since our room Le 1615 is located on the ground floor, the squeaky flooring of the room upstairs disturbed us. In the heat of the city! Clean and confortable!